If you're thinking about taking on the Coast To Coast Walk, then you've come to the right place. The C2C, devised by the late Alfred Wainwright, continues to be one of the most popular long-distance walks in the world. 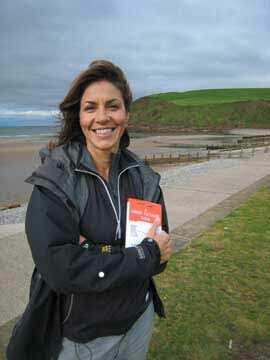 Julia Bradbury pictured at the start of her Coast to Coast walk, clutching her trusty copy of Alfred Wainwright's timeless guide. Her series of six BBC programmes capture the essence of the walk, as well as showing the best scenery in the UK. Known as the Queen of the Coast to Coast, Doreen Whitehead wrote the first ever accommodation guide in 1986. Wainwright called it 'indispensable' and her annual offering still remains the most reliable and popular listing of B&Bs along the walk. Read what Doreen has to say on the subject. 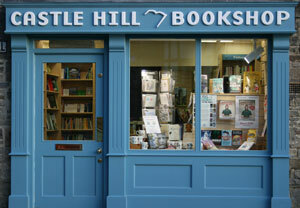 For almost as long as there has been a Coast To Coast Walk, Castle Hill Book Shop has been selling guide books and maps to hikers from their book shop in Richmond, Yorkshire - which as it happens is at the half way point on the trek! You'll find over 40 years of experience and hospitality (the kettle is always on) hard to beat! Check out the full range of Coast To Coast books and maps currently available.